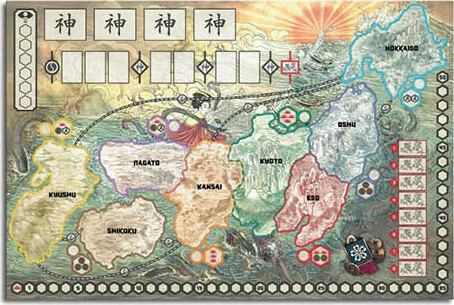 The heart of the board shows the Map of Japan, which is where most of the conflicts in the game play out. During their turn, players will place their chosen Political Mandates in these slots, going from left to right. 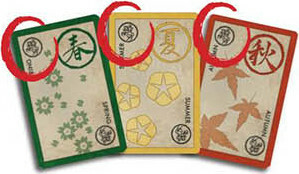 At the start of each game, Honor Track 4 random Shrine tiles are These slots are used to mark placed in these slots. These the relative Honor between represent the Shrines the the Clans. A Clan with its Shinto may go to in order to marker above another has worship the different Kami. Whenever the Political Phase reaches one of these symbols, a Kami Turn takes place, with each Shrine being resolved in order from left to right. These slots are used to mark the relative Honor between the Clans. A Clan with its marker above another has more Honor than that Clan. Every Season starts with a Tea Ceremony where Alliances are forged. These slots and symbols indicate the Turns during each Political Phase. The Map is divided into 8 different Provinces delineated by thick, colored lines. The Provinces may be occupied by Figures and Strongholds. These lines connect certain Provinces across the Map. Figures may Move between two Provinces connected by a Shipping Route as if they were adjacent. These hexagons, attached to the Province, display what Reward it grants when a player successfully Harvests it. These can be several combinations of Coins, Victory Points, and/or Ronin tokens. If two Provinces are considered adjacent, this is evidenced by a two-colored Border line separating them. Figures may Move between adjacent Provinces by crossing these Borders. Each Province has a slot to place a War Number token, as a reminder of whether a Battle will take place in it this Season, and where in the War order it will take place. When the Political Phase reaches this symbol, it ends and the War Phase begins. These slots are used to track each Clan's Victory Points (or VP) throughout the game.If a Clan moves beyond the 50 slot, move its marker back to the 1 slot but flip it upside down as a reminder to add 50 VP to their score. At the start of each Season, the Battles that will take place during the War Phase are randomized by placing a number of that Season's War Province tokens on these slots. Each of the Clans has its own Clan Screen that displays all of its relevant information. Keep in mind that nothing should be hidden behind the Screen during the Political Phase. During the War Phase, players' bids are hidden behind the Screens, but nothing else. Each Clan possesses a unique ability that is in effect throughout the game. This indicates each Clan's relative position on the Honor Track during the initial setup of the game. Each Clan starts the game with a Daimyo, a Bushi, and a Stronghold in its indicated Home Province. This section reminds players of the particularities of the different Clan Figures. This is a reminder of the bonus VPS players gain at the end of the game for collecting War Province tokens from as many different Provinces as possible. Players start each Season with only the number of Coins indicated on their Clan Screen. 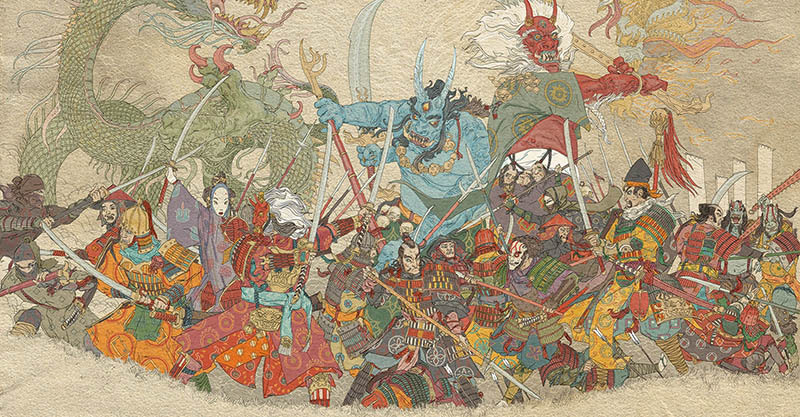 Each Clan possesses 10 figures: 1 Daimyo, 3 Shinto, and 6 Bushi. These are kept in Reserve next to your Clan Screen while not in use and are returned there if they're killed. All figures in the game have 1 Force, unless otherwise stated on a specific Season card a player has acquired. To more easily distinguish among the different Clan Figures, attach a black counter base to all Daimyo and white counter bases to all Shinto. Bushi: These are your foot soldiers. They do not possess any special abilities. While each Clan has two different sculpts for their Bushi, they all work exactly the same. 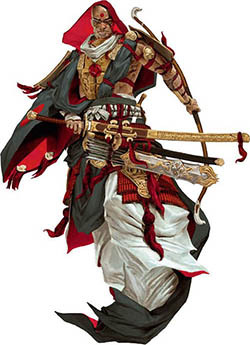 Shinto: These spiritual warriors are able to battle like any Bushi, but they possess a special ability: when Recruited, you may choose to send them to worship a Kami instead of staying on the Map. Daimyo: This is the leader of your forces and your most reliable figure. It cannot be taken Hostage by other players and cannot be removed from the Map by a Betray action. It is also immune to other special effects, such as a Monster's ability to automatically kill a figure. Monsters: These legendary creatures can be added to your Clan with a Train action. When acquired, attach one of your Clan's color bases to it. The Monster is immediately Summoned to one of your Strongholds and is part of your Clan for the rest of the game. If it is killed, it goes to your Reserve. There is no limit to the number of Monsters a Clan may have (even if the Clan runs out color bases for them). Each Monster has a special ability described on its Season card ( their Force is still 1, unless otherwise stated ). 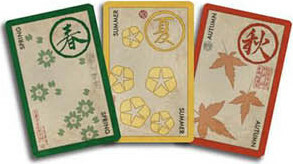 Season cards are divided into 3 Seasons: Spring, Summer, and Autumn, bringing varied abilities to the Clans who acquire them. Core Season cards have no special symbol on the back, indicating that they must be present in every game. Season card Sets each show a special symbol on the back to identify them. Each game, players will choose (or randomly select) 1 Set of Season cards to add to the Core cards. Enhancement (green) - These cards are abilities that enhance your Clan, giving special abilities to your figures or your actions. Virtue (blue) - These cards allow you to gain extra Victory Points or other benefits triggered by specific conditions. Monster (brown) - These cards give your Clan a Monster figure with a unique ability. War Upgrade (red)- These cards grant you special benefits that trigger at the start of each War Phase. Winter Upgrade (light blue) - These cards offer bonus Victory Points, triggered by specific conditions at the end of the game. 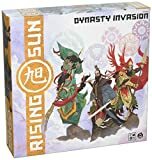 Honor is a palpable element in Rising Sun. Having high Honor will give you several advantages, while having low Honor may grant you the allegiance of the darker elements of the world. But above all, Honor settles all disputes. The Honor Track ( ) at the top left of the board is used to keep track of each Clan's Honor in relation to one-another. The Clan with their marker at the top of the Honor Track has the highest Honor, while the Clan at the bottom has the lowest Honor. If a Clan's marker is above another's, it has higher Honor than them. If a Clan's marker is below another's, it has lower Honor than them. Whenever there is a tie, the tied player with the highest Honor wins. This counts for any ties, whether it's comparing players' Force in a Province during a Harvest or a Battle, comparing their Force on a Shrine during a Kami Turn, or comparing their Coins on a War Advantage during a Battle. If players are tied, check the Honor of the tied players. The one higher on the Honor Track wins the dispute. If there's ever a conflict in the timing of the execution of an ability, the involved player with higher Honor decides whether to go first or last. Several different actions may cause a player to either gain or lose Honor. Honor is always relative between the Clans, so no two Clans can ever occupy the same slot on the Honor Track. Each time a Clan gains Honor, move its marker up 1 slot on the Honor Track, at the same time moving down 1 slot the Clan marker that was above it. If a Clan is already at the top of the Honor Track, gaining Honor has no effect. Example: The TURTLE Clan gains Honor, so its marker is moved up, while the LOTUS marker above it is moved down. Each time a Clan loses Honor, move its marker down 1 slot on the Honor Track, at the same time moving up 1 slot the Clan marker that was below it. If a Clan is already at the bottom of the Honor Track (disregarding any empty slots at the bottom), losing Honor has no effect. Example: The LOTUS Clan loses Honor, so its marker is moved down, while the DRAGONFLY marker below it is moved up. In Rising Sun , players are encouraged to use diplomacy, negotiation, and even bribery to further their cause. "I'LL stay out of Kyoto this Season if you stay out of Hokkaido". "IN this Battle, leave Hire Ronin to me and I'll let you Take Hostage". Keep in mind, however, that no deals are truly binding. Players are free to break their promises at any point, though the consequence is that the other players most likely won't want to make any further deals with them. Deals can be made in secret, without other players overhearing them. "I'LL give you 2 Coins to Ally with me this Season". "IF you play Harvest now, I'll give you half of the Ronin Iget from my Harvest Rewards". Again, keep in mind that these deals are not binding.